Okay we are no upgraded to the latest version of the forum software. We're running 3.1.2 and thge latest addons. There's two bugs that I'm raising to the writers. 2 Content system cannot be upgraded at the moment so remains offline (this is a new feature that we've not had public yet). If there's any other weirdness going on let me know on here and I'll add it to the ticket. Please use the new skin (Elegant) that is listed at the bottom left of your screen if you are not already using it. There will be errors if you use the older forum skin for the moment. I have raised tickets with Invision to get the current bugs fixed after upgrade. Update 1958: 14/11/2010 all are now sorted bar issue #2. Update 2111: 14/11/2010 you can now like and link items to Facebook for people that love this sort of thing Forum logins can also be synced with your Facebook login. You can't create an account from Facebook, but you can login via Facebook authentication once you have linked your account to Facebook on here. There's also an issue with logging in at the moment. Once a user logs out, you cannot login. It's been added to the list of things that are urgent and need to be fixed. Not an urgent one, but is the "view new topics" option still in existance? Do i just need to find the new button for it . I'm in "arnies elegant/blue" currently. How odd, I changed the skin to "IPboard" and its all back to how it was . The update must have changed my skin setting.... However the view new posts page the button links to dosn't appear... Rather strange. I get the "done" confirmation at the bottom but a blank screen. Switching to the previous skin I get the View New Content where it usually is, it doesn't work though (nor any other search), the screen just remains blank. Same issue here. 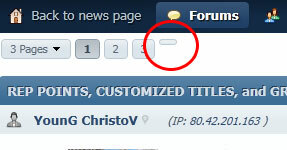 Though the "Elegant Blue" skin does not have the VNP link/button, it does work when you use the full URL for the page. In the old IPboard skin, the VNP link/button is there, but it leads to a blank page, and even if you use the full URL it is still rendering a blank page. Please see my above post. You need to use the new skin for the moment. The old skin needs to be recomplied and will result in errors. I believe the "view new content" button at the bottom of your screen in the bar near RSS feed is the one you're talking about in reference to new posts? Any chance we can have English (UK) instead of English(USA)? Any chance of getting the view new posts button moved to the top of the forum list? It's pretty much the only button i use on the main page other than accessing PM/Profile. There is no English localization in existence sadly.. I ought to create one. I've dropped the "USA" bit off for now. Country definitions have been updated for you. There were two definitions for Isle of Man, hence it repeated both. Since when I click on the drop-down arrow next to English, it doesn't give me any other language options, is there even a point in having it there? Oh, by the way, I quite like the floating menu bar at the bottom - especially the "back to top" link on the right. Nice touch. Exactly my thoughts.. I went to disable it and er.. you can't, not without editing the default skin. I'm written to the software manufacturers and asked for a development pack for the language files. I'll write the "British" language pack. Then we can have a USA and a Brit one. Might as well have the option! So once everything is sorted out then we can use the 'old' skin? Loving the new skin, especially with the Facebook Likes! I'm going to be spamming that button from now on. Thanks for the bar at the bottom of the screen, it's saving me from scrolling back up in threads! I'm liking the new mobile version too. Is this a new feature or perhaps because I wasn't around at the time of the change I was required to do something that hasn't been done? That may be because the board was upgraded then and we need to rebuild the post counts. I haven't done it as it'll take 4 days to run and runs at a high load and will slow the server down. Regarding themes I could do a dark one if needed.